Rex E Barney was born on December 19, 1924 in Omaha, Nebraska. He was an all-round athlete at Creighton Prep and signed with the Brooklyn Dodgers for a $5,000 bonus in 1943. The 18-year-old right-hander joined the Durham Bulls in the Piedmont League where he was 4-6 with an earned run average of 3.00. 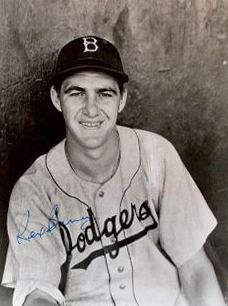 Later in the season, he was promoted to Montreal and made his major league debut with the Dodgers against the Chicago Cubs on August 18, 1943. On his first pitch, Barney hit Eddie Stanky squarely in the back. He made eight starts and despite his wildness – something that would plague him throughout his career – he was an outstanding prospect. Nevertheless, military service would delay his advance. He enlisted in September 1943 and served with the Army at Fort Riley, Kansas. Playing baseball with the Fort Riley Centaurs, Barney’s teammates included Pete Reiser, Lonnie Frey, Ken Heintzelman, Harry Walker and Al Brazle. Not surprisingly, the team got off to an 18-1 start in 1944. In September 1944, Barney played in the annual semi-pro tournament with the Wichita Coleman Lamp Rangers and was chosen as an All-American. Ray Dumont - National Baseball Congress President – named Barney as the greatest prospect either in or out of the majors. Barney arrived in Europe in January 1945 and served with the 4th and 6th Armored Divisions in France and Germany. He was the commander of a lead tank, roaming the advance positions to draw enemy fire from sunup to sundown, and suffered shrapnel wounds to his leg and back. He received two Purple Hearts and a Bronze Star. 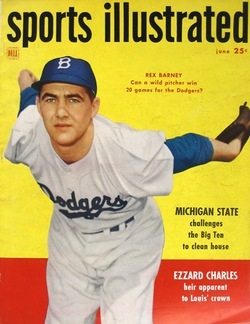 Barney was back with the Dodgers in 1946. After two seasons where he struggled with wildness and injuries, his 1948 campaign was a glimpse at was had been predicted for him by so many. Barney went 15-13 with a 3.10 ERA. He hurled four shutouts and 12 complete games. September 9 was the crowing point of that season with a no-hitter against the New York Giants. He threw 75 strikes among his 116 pitches as he held the Dodgers’ cross-town rivals hitless in a 2-0 victory on a rainy night at the Polo Grounds. He walked two and struck out four, and he had even the Giants' fans cheering. Weeks later, Barney broke a leg in two places sliding into second base. The injury healed, but his pitching rhythm was never the same. He pitched his last game in the major leagues in September 1950, at the age of just 25. Following two seasons in the minors with Fort Worth and St Paul, Rex Barney was out of baseball. In 1964, Barney joined the Baltimore Orioles’ organization and later became the team’s much-loved public address announcer. It was a position he held for 25 years until his death on August 13, 1997. Rex Barney was 72 years old.